The album title came from Claude Lévi-Strauss’ 1964 study, which is kind of a New Pop thing to do, except I’m not quite sure how these ten songs work as conceptual tools to enable the formation of abstract notions and combining them into propositions. Perhaps it’s as simple as representing the early stirrings of retro-nuevo pop; music clearly aware of its past yet unafraid of, at least, the recent present. Interestingly the trio originally wanted Prince to produce some of the album, but their American record company instead offered them Prince associate David Z, with whom they completed the record at Paisley Park. Unlike some other recent TPL entries, this has held up pretty well. At thirty-five minutes and fifty seconds, it doesn’t outstay its welcome – but one has to remember that the Buzzcocks cover dates back to 1986 (for use in the movie Something Wild) and three other songs, including “Good Thing,” were featured (as were the band themselves) in 1987’s Baltimore knockabout Tin Men. No matter. I confess that for much of the time I have no idea what Roland Gift is going on about on this record, except that it’s all about love; he’s probably as unlucky as Bernard Sumner, but sounds both angrier and lighter of spirit and in truth I really don’t want to find out what he’s saying, for this is pretty nifty and catchy pop (the debut album’s sleeve-worn politics are gone, but that works to the group’s advantage). Andy Cox’s guitar dallies with bitonality on both “She Drives Me Crazy” and “I’m Not The Man I Used To Be.” The closest the record comes to The (English) Beat is the subtle ska underbelly of “Good Thing” and the exultant “It’s OK (It’s Alright).” They know their Motown and Stax but find an unhackneyed use of the “Funky Drummer” loop (on “I’m Not The Man I Used To Be”) and even go in for some Man Parrish electro on “Don’t Let It Get You Down”; when Graeme Hamilton enters, we are abrputly back in 2 Men, A Drum Machine And A Trumpet territory. Hurting gospel is also not beyond the group; Gift’s seldom-used lower register in “As Hard As It Is” puts me in mind of those other Baltimoreans, Future Islands (two musicians dutifully backing up an idiosyncratic singer). Overall, the record gives a good early portrait of the kind of approach that the then eleven-year-old Mark Ronson would eventually make his own. 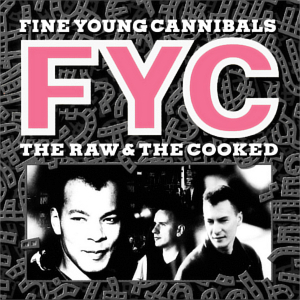 Perhaps knowing their limitations, Fine Young Cannibals more or less didn’t do anything after this record, but then they didn’t really need to. I note that one of the backing singers on “Good Thing” is Simon Fowler, presumably the future Ocean Colour Scenester. David Z is more than a "instead" offer, as he had more to do with Prince's "Kiss" production than Prince himself, and that clear funk sound found here has lots of elements in common with "Kiss". "I'm not the man I used to be" reminded me of my Dad's "String-a-longs" album (Think 'like The Ventures, but not actually The Ventures') although I have no doubt it's sampling from something much cooler than that. So, a 'pulled together' album, much like how Screamadelica was made. Number one albums as short as this will become rarer and rarer as CD becomes the dominant format, of course, and I'm not at all sure whether that will be to TPL's advantage. FYC's disappearance seemed slightly odd initially, but ultimately seemed to make enough sense that when "The Flame", presumably a remnant from the abortive third-album sessions, appeared well over halfway through the 1990s it seemed an eerie relic indeed - not that that stopped it being played to death on commercial radio (which pretty much kept mainstream 1980s music in any sort of public profile for quite a lot of the next decade). OCS weren't too far from getting started properly but won't appear directly here for a very long time (and even when they do, their role on 'Stanley Road' notwithstanding, it won't be with their actual biggest album - suffice it to say it will be "comedown synchronicity" with the entry before it). I didn't know Simon Fowler was involved with this album, but the early, 'baggy' OCS (I'm thinking of Sway in particular, and their live shows) may have drawn heavily on I'm Not The Man I Used To Be - I'd always put that down to the Stone Roses' shadow but this is a much better fit. INTMIUTB still sounds crisp and slightly futuristic to me in its minimalism and subtle build, in a way that She Drives Me Crazy and Good Thing really don't.